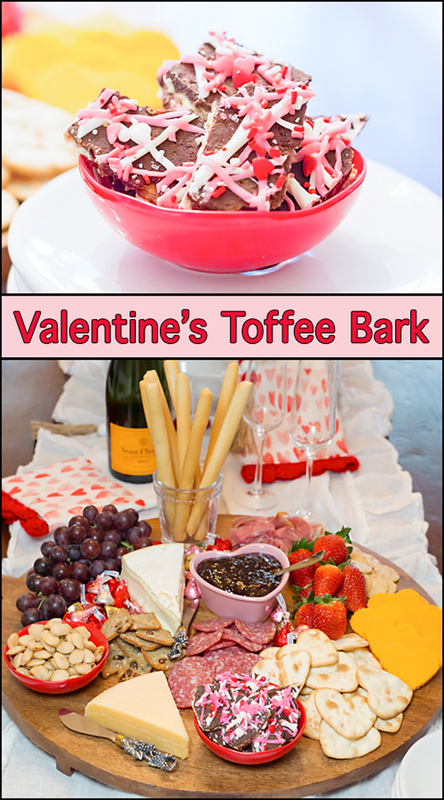 Valentine’s Toffee Bark was the perfect addition to our Valentine’s Day charcuterie board! 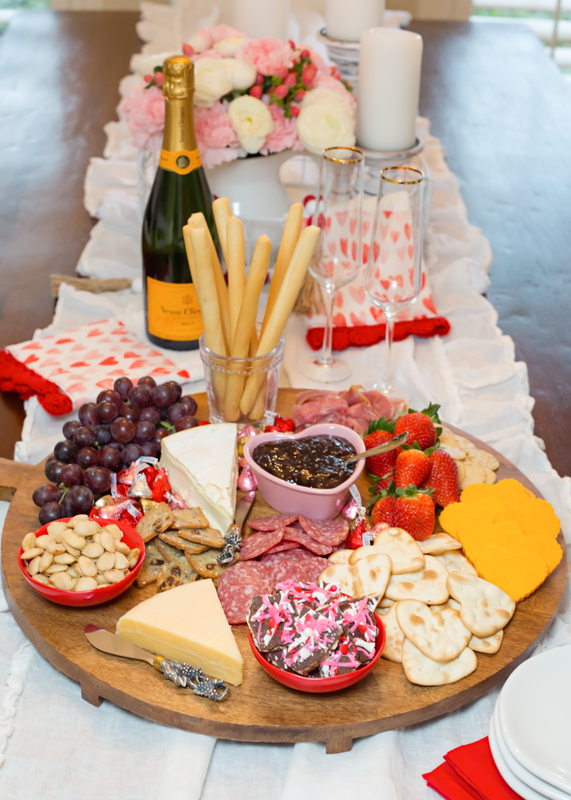 It added just that perfect bite of sweet after indulging on all our charcuterie board favorites! 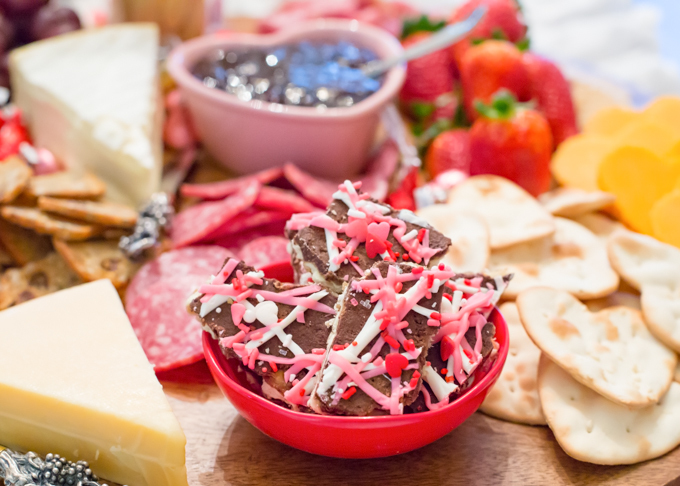 The only thing this Valentine’s charcuterie board was missing was some blue cheese. I know a lot of folks aren’t fans, but it’s one of my favorite cheeses! What could be better than a platter of salty cheeses, crispy crackers, fresh fruit, nuts, and chocolate?!? Since I’ll be gone this Valentine’s Day, it seemed only appropriate to have a Netflix night and delicious snack dinner with my honey a few days early. I never make dessert when it’s just my husband and I, but a Valentine’s Day celebration calls for chocolate. Am I right? Or am I right? Ok, chocolate and a sip of bubbly! And cheese and crackers (which I think is my husband’s love language). Seriously, though, the man loves cheese & crackers! I put together cheese boards pretty regularly, varying them by what I have on hand in the fridge and pantry. 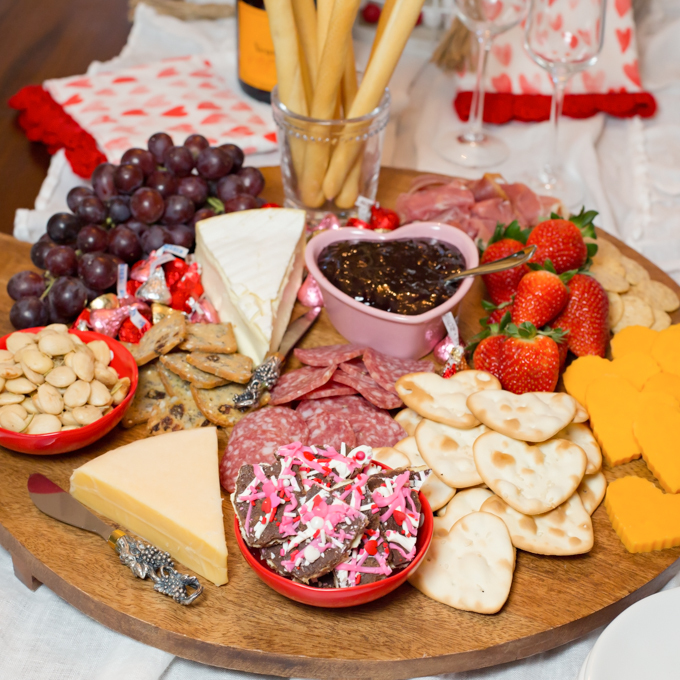 Tonights was full of salami, prosciutto, three kinds of crackers plus breadsticks, gouda, cheddar (which I cut heart shaped using a cookie cutter), and brie. 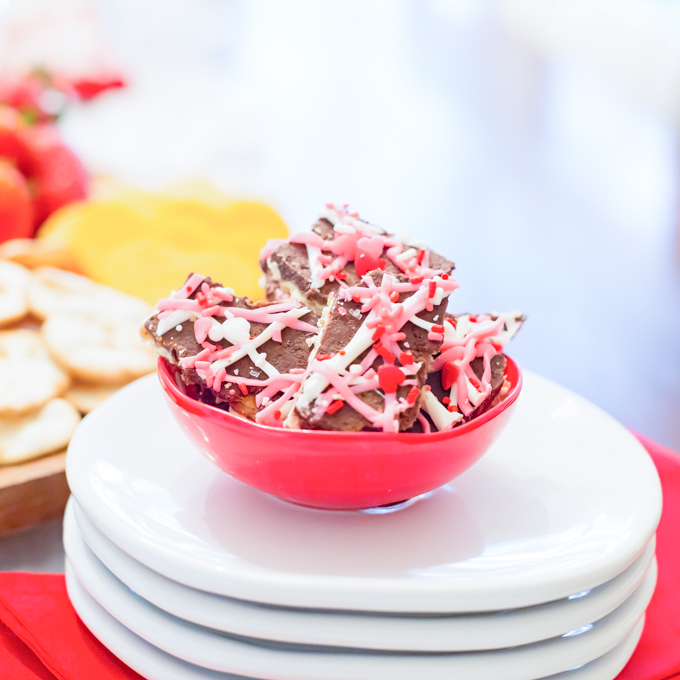 I added some tart cherry spread to go along with the brie, rosemary marconi almonds, red grapes, fresh ripe strawberries, a handful of Hershey kisses, and a small bowl of Valentine’s Toffee Bark. We enjoyed our dinner much more than the Netflix series. A couple episodes in, and we’re done. If you have any recommendations for a great series, I’d love to hear it. You may have seen this easy to make toffee bark recipe before. I’ve seen it floating around on Pinterest and Instagram so figured I should give it a try. It’s only a few ingredients and is quick and easy to make. Start by layering saltine crackers on a large sheet pan lined with foil, parchment, or a silicone liner. I used my Silpat liner and the toffee didn’t stick and was easy to remove from the pan. Next, you cook together the brown sugar and butter and pour the hot mixture on top of the saltines. Place sheet pan into preheated oven and bake for 5 minutes. The next step is to remove the pan from the oven and distribute the chocolate chips evenly over the hot caramel. Place back in oven for just a couple minutes, then remove pan and spread chocolate evenly over the crackers. While the pan is cooling, melt the candy melts (I used pink and white) and pour into zip lock bags. Cut a small hole in one corner and squeeze colored chocolate in a “squiggly” design over top of toffee bark. Immediately decorate with your favorite sprinkles. Place pan into freezer or refrigerator to cool. Once cool, cut or break into small pieces. 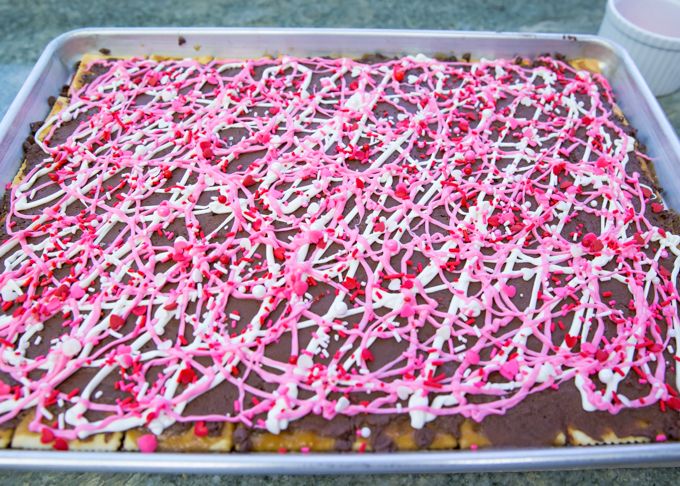 There you have it . . . . Valentine’s Toffee Bark!! It’s the perfect bite of sweet & salty!! 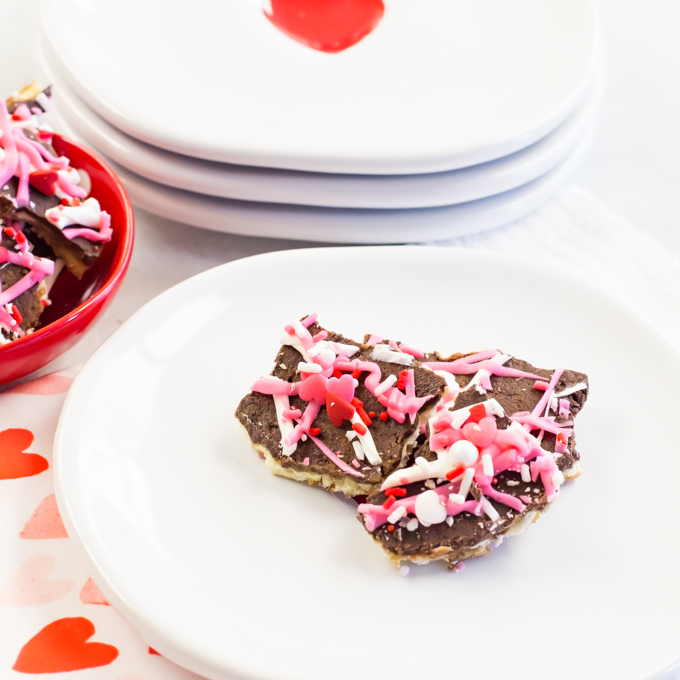 I can’t wait to make this Valentine’s Toffee Bark, often called Saltine Cracker Toffee, or Christmas Crack (because after one bite you can’t stop eating it) again soon! Hmmm, I wonder if I’ll get lucky and catch a Leprechaun with some Leprechaun Toffee Bark?? Lined rimmed baking sheet with foil or parchment (spray lightly with baking spray) or preferably using a silicone baking sheet. 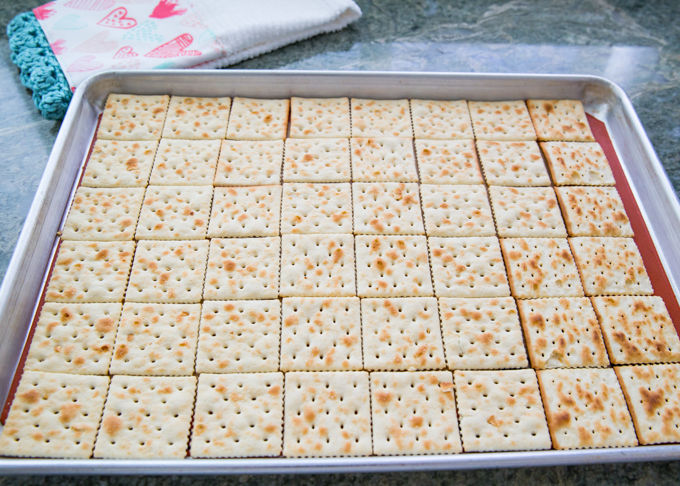 Arrange crackers on baking sheet to completely fill the bottom (break crackers if needed to fill in gaps). In a medium saucepan over medium heat, add the butter and brown sugar. Stir continually until sugar melts and mixture begins to boil. Continue to boil (still stirring) for 2-3 minutes. 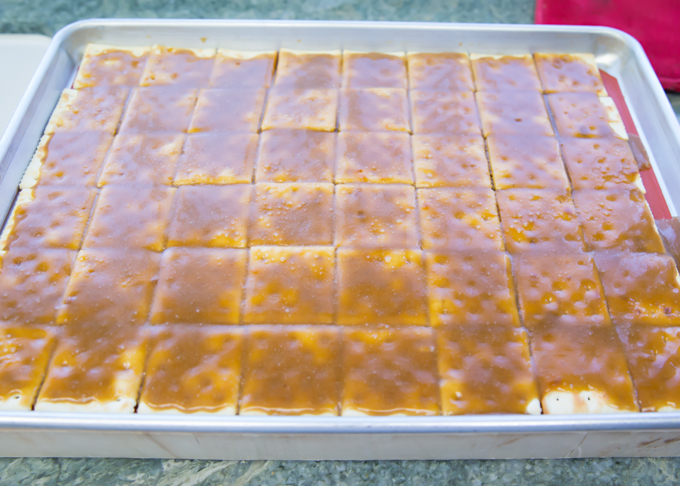 Carefully pour hot caramel mixture evenly over saltine cracker layer. Spread with spatula if needed. Place sheet pan into hot oven and bake for 5 minutes. Remove pan from oven and spread the chocolate chips evenly over hot caramel. Return to oven and bake for 2-3 minutes. Remove pan from oven and using a spatula, spread the melted chocolate over the caramel. Following the directions on the Candy Melts bag, melt in microwave. I placed mine in a glass measuring cup and microwaved for 1 minute at 50%. Stir till smooth. Pour warm colored chocolate into quart size zip lock bag and cut a small hole in one corner. Gently squeeze chocolate in a "squiggly" pattern over bark. Place pan in refrigerator or freezer to cool. 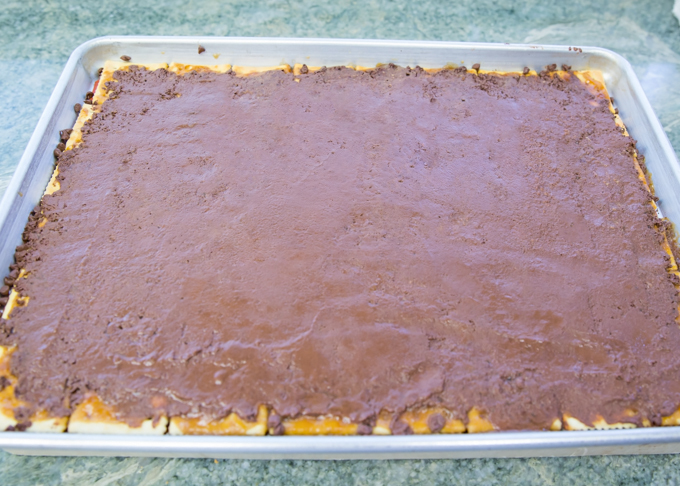 Once toffee bark is firmly set, remove from pan and cut or break into pieces. I don’t know about you, but I can’t wait for the weather to warm up a bit! 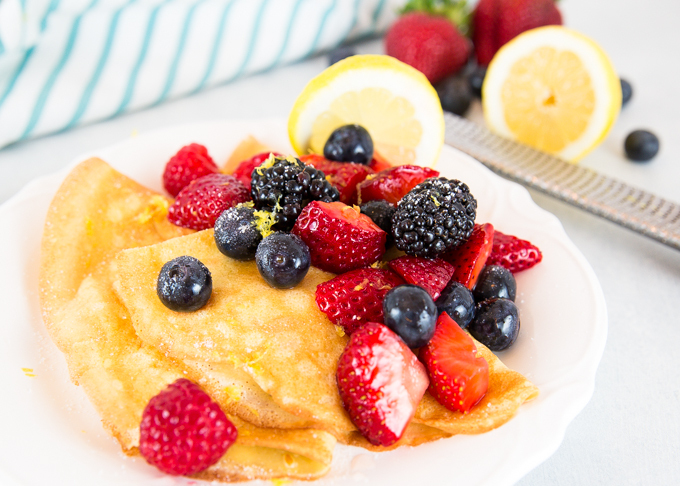 I’m ready for some really sweet berries to hit the stores so we can enjoy these Lemon Berry Crepes!